Find connection. Find your calm. What I like most about your classes is your guiding through the practice, atmosphere and honestly mostly you … You’re the best yoga teacher I’ve ever had. This was the most beautiful massage I have had. 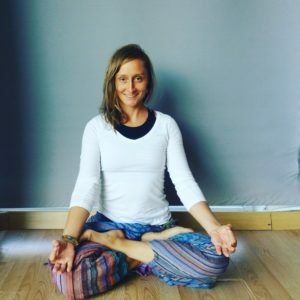 Eszter is pretty much the personification of the gentle, compassionate attitude that I try to cultivate through my yoga practice. She is a source of inspiration as well as a great teacher. Join our gentle but dynamic yoga classes in English in Budapest, where we focus on the breath to still the mind. Through practicing vinyasa yoga, we allow each movement to follow the inhales and the exhales. We learn how to soften and strengthen at the same time. Leave feeling centered and rejuvenated. Acroyoga joins yoga and healing therapies with other movement styles, including dance and acrobatics to enhance communication and confidence. It also increases stamina and inner strength. We learn how to play again and work on regaining trust in a supportive environment. What you can expect: games, trust-building exercises, lots of fun challenges, therapeutic movements and massage. Upper beginner course to launch on 8 April, details here. Sign up now. Have you heard that Thai yoga massage functions as “the yoga of the lazy”? I like to rephrase this as Thai yoga massage can provide the ultimate re-set for the physical and subtle body. It can bring about much-needed emotional and physical release, in a passive and comfortable way. Hello, I’m Eszter and I teach gentle but dynamic yoga classes in English in Budapest. Before becoming a vinyasa yoga instructor, I have lived and worked in challenging environments. I’ve come to believe that yoga, meditation and other body-based practices can help us ground, relax and center ourselves. Do you feel that you also need all this? During my yoga classes as well as with Thai yoga massage, I will happily assist you in your quest for a sense of tranquility. Calm. Stillness perhaps. Acroyoga may seem far from still, but you only have to try to realize that it is possible. I am a Yoga Alliance and AcroYoga Montreal-certified instructor and I would love to be a part of your journey.